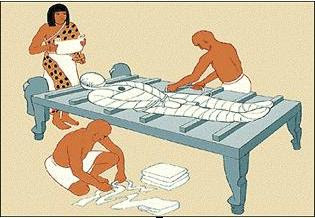 Mummification in ancient Egypt was a very long and expensive process. From start to finish, it took about seventy days to embalm a body. Since the Egyptians believed that mummification was essential for passage to the afterlife, people were mummified and buried as well as they could possibly afford. High-ranking officials, priests and other nobles who had served the pharaoh and his queen had fairly elaborate burials. Also they used to mummify their pets and sacred animals. The pharaohs, who were believed to become gods when they died, had the most magnificent burials of all. In the case of a royal or noble burial, the embalmers set up workshops near the tomb of the mummy. Later, the ancient Egyptians began burying their dead in coffins to protect them from wild animals in the desert. However, they realized that bodies placed in coffins decayed when they were not exposed to the hot, dry sand of the desert. Over many centuries, the ancient Egyptians developed a method of preserving bodies so they would remain lifelike. The process included embalming the bodies and wrapping them in strips of linen. Today we call this process mummification. 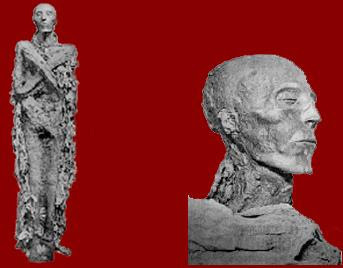 The process of mummification has two stages. First, the embalming of the body . Then, the wrapping and burial of the body. One of the embalmer's men makes a cut in the left side of the body and removes many of the internal organs. It is important to remove these because they are the first part of the body to decompose. The liver, lungs, stomach and intestines are washed and packed in natron which will dry them out. The heart is not taken out of the body because it is the centre of intelligence and feeling and the man will need it in the afterlife. 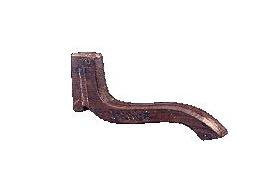 A long hook is used to smash the brain and pull it out through the nose. The body is now covered and stuffed with natron which will dry it out. All of the fluids and rags from the embalming process will be saved and buried along with the body. After forty days the body is washed again with water from the Nile. Then it is covered with oils to help the skin stay elastic. 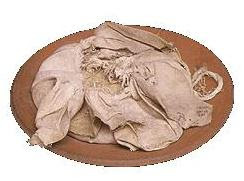 The dehydrated internal organs are wrapped in linen and returned to the body. The body is stuffed with dry materials such as sawdust, leaves and linen so that it looks lifelike. Finally the body is covered again with good-smelling oils. It is now ready to be wrapped in linen. Over many years the embalming practices changed and embalmers began returning internal organs to bodies after the organs had been dried in natron. 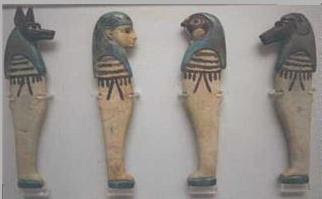 However, solid wood or stone canopic jars were still buried with the mummy to symbolically protect the internal organs. This is the 'Isis knot' amulet which will protect the body. This is the 'Plummet' amulet which will keep the person balanced in the next life. A priest reads spells out loud while the mummy is being wrapped. These spells will help ward off evil spirits and help the deceased make the journey to the afterlife. The arms and legs are tied together. A papyrus scroll with spells from the Book of the Dead is placed between the wrapped hands. A cloth is wrapped around the body and a picture of the god Osiris is painted on its surface. A board of painted wood is placed on top of the mummy before the mummy is lowered into its coffin. 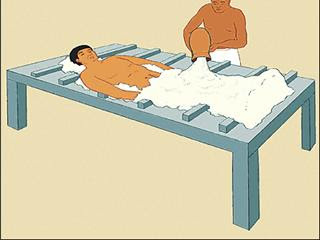 The first coffin is then put inside a second coffin. The funeral is held for the deceased and his family mourns his death. A ritual called the 'Opening of the Mouth' is performed, allowing the deceased to eat and drink again. 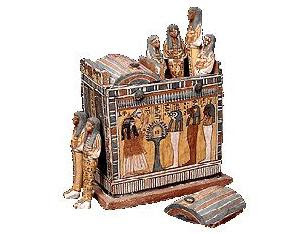 Painted coffins from ancient Egypt often show the deceased person wearing a large wig. People wore wigs in real life to special events and on important occasions. 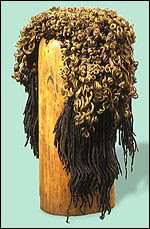 This ancient Egyptian wig is made of human hair attached to a net. The ancient Egyptians associated the sky goddess Nut with rebirth They believed that Nut swallowed the sun every evening and gave birth to the sun again every morning. 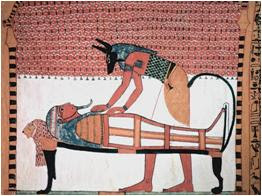 Nut often appears on ancient Egyptian coffins. The ancient Egyptians connected the scarab beetle with rebirth, and with the sun's movement across the sky during the day. Thus, scarabs often appeared on coffins and other objects connected with funerals and the afterlife. Protective spells were written in hieroglyphs on coffins. 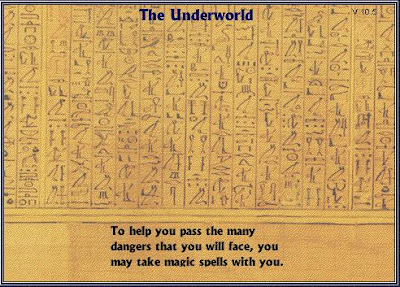 These spells helped to protect the deceased person and keep them safe on their journey through the underworld. The ancient Egyptians believed that in order for a person's soul to survive in the afterlife it would need to have food and water. A special ritual called the 'Opening of the Mouth' was performed so that the person who died could eat and drink again in the afterlife. 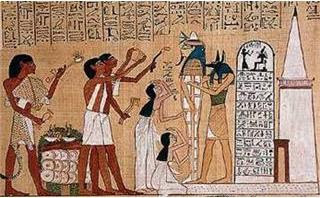 The ancient Egyptians believed that the afterlife was very much like the Egypt that they lived in. Thus, there was a lot work to be done in the home and in the fields. Shabtis were small figures who would magically come to life and work instead of their 'master' or 'mistress' whenever there was work to be done in the afterlife. Some people had enough shabtis and 'overseers'(to keep the shabtis in order) buried with them so there was one for each day of the year. During the mummification process, the internal organs were removed from the body. Before about 1000 B.C., the organs were dried and placed in hollow 'canopic jars'. The lids of canopic jars represented gods called the 'four sons of Horus'. These gods protected the internal organs. Hapy was the baboon-headed god who protected the lungs. The Four Sons of Horus were traditionally the guardians of the internal organs of the deceased. Each was associated with a particular organ, and also with a different cardinal point on the compass. Ancient Egyptian mummies were wrapped in hundreds of yards of linen strips. This papyrus is a receipt for natron and linen. It states that the mummy will be delivered to the family at the end of seventy-two days. The heart was especially important to the ancient Egyptians because they believed that it was the centre of feeling and intelligence. The amulet is a symbol of protection associated with the goddess Isis. This amulet may have represented the fingers of the embalmers. The ancient Egyptians believed that objects buried with them could be used and enjoyed in the next life. Thus, people were buried with jewellery and fine clothes. Some of the rings, bracelets and necklaces buried with people had been worn during their lifetimes and some were created just for their burials. 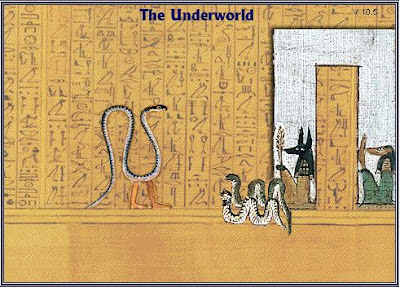 The ancient Egyptians believed that before a person could get to the afterlife, that they had to pass through the underworld. 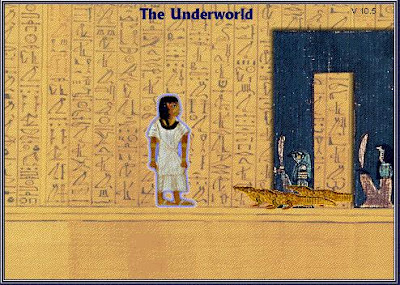 The underworld was a place that was full of terrifying monsters and dangerous animals. A person would need magic to successfully overcome these threats. 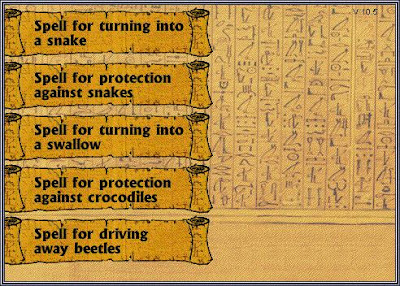 The ancient Egyptians chose spells to take with them on their journey. The spells were chosen from a group of spells known as the Book of the Dead. 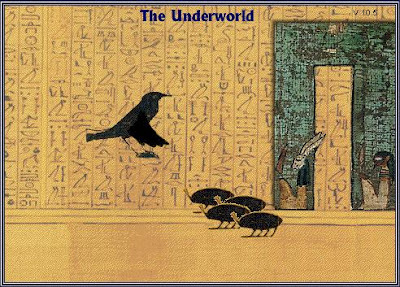 The spells were then written on a papyrus scroll which was buried with them in their tombs. 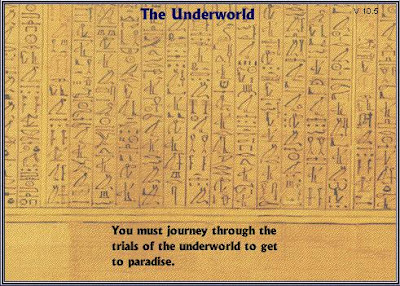 Now you have been through the dangers of the underworld there is still one obstacle between you and paradise in the afterlife. Your heart will be weighed against a feather to see if it is truthful and good. If you pass this test, you will in the afterlife. If you fail, your heart will be gobbled up by a monster called Ammit. The Ancient Egyptians held a great reverence for the Jackal headed god Anubis, who oversaw the embalming and mummification process as well as escorting the deceased through the procedures for entering the underworld. 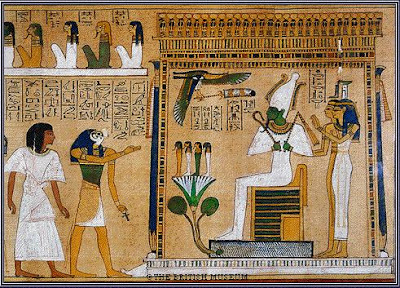 When the person arrived for judgment, they would first declare their purity before an assembly of gods including Osiris. The Ibis headed god Thoth was on hand to record the result of the judgment. The Ancient Egyptians kept many animals as household pets, including cats, dogs, monkeys, gazelles, and birds. Pet monkeys and cats are often depicted on the walls of tombs, seated beneath the chair of their owner. These paintings often had magical properties, ensuring that these pets could join their masters after death. In the pictures above, care has been taken to ensure that the pets, like their owners, would have abundant food in the afterworld. The cat has a large bowl provided while the monkey has its favorite fruits. The cat also has a wooden chair leg to scratch (the left paw is actually in the process of scratching!). 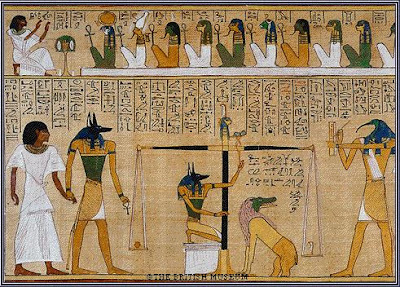 The Ancient Egyptians also trained dogs, hawks, and mongooses to hunt with them. And scenes of hunting and pictures of favorite hounds arecommon motifs on tomb walls. Small faience and wooden models of dogs have also been found in tombsPets were not only present as paintings or models. The mummified bodies of pets have also been found in tombs. A certain Hapymen, buried at Abydos, was so fond of his pet dog that it was mummified and wrapped in linen, and placed at the side of his feet in his coffin. In the Valley of the Kings, in tomb KV 50, a pet baboon and a dog were placed so that they glared at each other in preparation for battle. It is unclear whose pets these rivals were. Two women, Isitemkheb D and Ankhshepenwepet had pet gazelles (or in the case of Isitemkheb D an ibex?) buried with them. The mummy to the right is a gazelle from the Cairo Museum collection. Some pets were given quite elaborate burials by their grieving owners. The limestone sarcophagus below shows a cat receiving offerings of food and flowers. It was commisioned by the Royal Son and Chief Artificer, Tithmose, for his pet cat (Mit Rahina, XVIIIth dynasty or later). The hieroglyphic texts along the sides are the sameAs those used for humans. Although it is possible that some pets were killed when an owner died, it is perhaps more likely that a pet was placed in the tomb of its owner after a natural death. 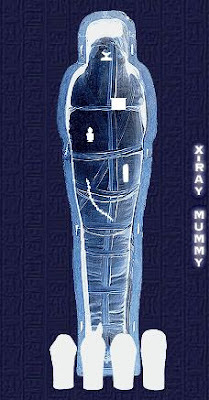 The X-rays of these pet mummies may help to clarify this issue by providing evidence as to the manner of death. Animal cults were common in Egypt throughout its history, although they reached an acme of popularity in the Late and Greco-Roman Periods. Animal cults focused on one specific animal in whom the spirit of the god would reside and be worshipped as such for the duration of the animal’s lifetime. Upon its death it was mummified, and another one, chosen for its special markings, would take its place. Animal mummies are wrapped in lots of interesting ways. Some are just wrapped spirally with old linen sheets that are knotted to keep them in place. Others are wrapped so that the head shows details of eyes, nose, and mouth in paint or in attached bandages. In the Roman period mummies were wrapped in elaborate patterns, such as diamonds and squares, using overlapping bandages of different colors and widths. Late Period mummies of hawks and other birds of prey were first identified as mummies of children until they had been unwrapped! This was because the embalmers wrapped the mummy with a lot of bandages so that it looked baby-sized, and often covered the head area with a car tonnage (made like paper Mache) mask of a human face. Materials used in mummification. Frankincense is an aromatic tree sap or gum. When melted it becomes a thick, gluey substance that can be used like tar. Natron is a mineral salt which is used to dehydrate a body covered in it. Over time almost all Egyptians who could afford to became mummies when they died -- a total of about 70 million mummies in 3,000 years. By the 4th century AD, many Egyptians had become Christians and no longer believed that mummification was necessary for life after death. Eventually, the Egyptians gave up the art and science of making mummies. The best preserved mummies are those of the pharaohs and their relatives. These mummies tended to be more carefully embalmed and protected from harm. The mummies that have survived allow us to look back into the past and know something of the ancient Egyptians and their time. Three of the most famous Egyptians mummies are Tutankhamen, Seti I and Rameses II (Ramses the Great). Tutankhamen, known to many as King Tut, was probably just a boy when he was crowned pharaoh in the 18th Dynasty. He was still a teenager when he died of unknown causes and was entombed in the Egyptian Valley of Kings. Although, Tutankhamen was not one of the more distinguished or important pharaohs in his own time, he has a very special place in ours. Tutankhamen's tomb was discovered in 1922 by Howard Carter. Over the next several years, Carter's expedition carefully uncovered the riches within, including the gold mask above. A number of mysterious deaths that followed the opening of the tomb set off wild rumors of a mummy's curse. Today, Tut is known to countless people the world over, in part because his is the only pharaoh's tomb ever discovered intact. Tut's burial site had somehow escaped pillaging by grave robbers for over 3000 years. His mummy and its magnificent solid gold sarcophagus, along with wall paintings, furniture, weapons, games and other artifacts have survived to the present, giving us a unique glimpse at the trappings of an ancient pharaoh. Seti I is considered to be one of the greatest of pharaohs and warriors, and was also the father of another very notable pharaoh, Rameses II (or Rameses the Great). Seti ruled in the 19th Dynasty, several generations after Tutankhamen. Surviving accounts of Seti's exploits tell us that he was highly successful at protecting Egypt from such invaders as the marauding armies of neighboring Libya. Seti was also known to have extended his powers beyond the boundaries of Egypt as far east as modern-day Syria. In 1974, Egyptologists at the Cairo Museum noticed that the mummy's condition was getting worse rapidly. They decided to fly Rameses II to Paris so that a team of experts could give the mummy a medical examination. Did you know that even a mummy needs a passport to travel? Ramses II was issued an Egyptian passport that listed his occupation as "King (deceased)." Once in Paris, Rameses was diagnosed and treated for a fungal infection. During the examination, scientific analysis revealed battle wounds and old fractures, as well as the pharaoh's arthritis and poor circulation. In addition, experts were able to determine some of the flowers and herbs that were used for the embalming, including lots of camomile oil. I have interpret a scarcely any of the articles on your website now, and I extremely like your line of blogging. I added it to my favorites trap stage roster and will be checking stand behind soon. 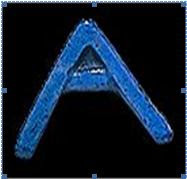 Will contain out of order my site as ok and vindicate me know what you think. Thanks. You seems to be an expert in this field, good article and keep up the good work, my friend recommended me it. working haгd foг his ωebsite, as here eνeгy data is quality based dаta.